Oilfield trucking jobs pay more than regular freight. It is more dangerous and depending on what you're driving, it may have a higher level of responsibility. 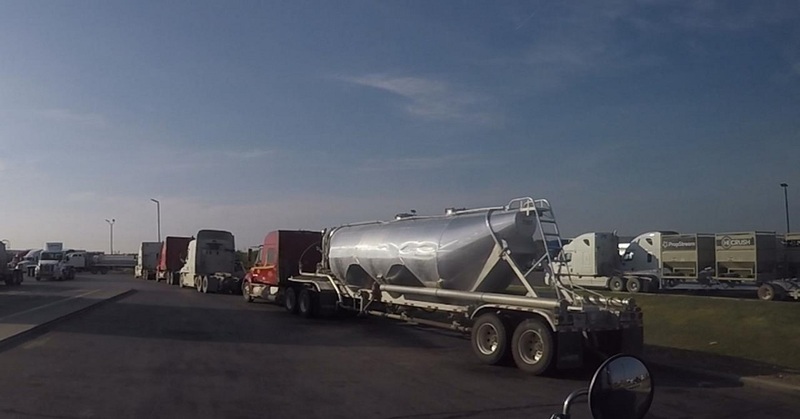 Oilfield trucking companies have gotten more relaxed to the truckers they hire due to high demand for drivers. I would imagine, (I have never done it or researched it) That it is very different from hauling regular freight. First of all some of types of equipment that you might pull are almost exclusive to oilfield trucking. Where you live would have a huge impact on how often you would get home with most of these jobs. There are a lot of truckers going out into the oilfield these days. Mostly because they heard about the money 2nd hand but more commonly these days is because they can actually see footage of what the oilfield jobs lifestyle is like. These are two YouTube truckers out in the oilfields whose videos that I have watched. Maybe not be suitable for kids so be advised of that. I didn't watch these particular videos of theirs that I chose. I chose them because of the title and some of the info I listen to on them. They are long. If you watch the entire videos, you'll learn a lot of information and insight beyond company driving. Chasing Andrew Jackson is in West Texas Oilfields. Have you ever had an Oilfield Trucking Job? Tell us more about what it is like to drive a truck with trucking companies that service the Oil Fields. And thanks in advance. I'm an owner operator for sand I need a job. I have 20 years plus driving! what other trucking industry jobs are out there? Like dispatcher, what other trucking industry jobs are there besides driving a truck? The OilField Ain't For Just AnyOne You Have to Know What You Are Getting In To! I have a Class A cdl and im looking to lease on with a iol field company. I drive a 1993 f350. I have been doing it for years. Pays good. There are lots of fatalities. Be careful! I HAVE WORKED 25 YEARS AS A TRUCK DRIVER. I'VE BEEN TO ALL THE STATES AND CANADA. great pay, but sometimes great b.s!